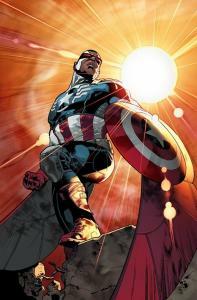 The all-new, Spy-Fi, highflying adventures of Sam Wilson Captain America and Nomad begin here! • Hydra is growing, the terrorist band have has infiltrated the Marvel Universe completely! But what is their ultimate goal? • United by Hydra, Cap’s rogue’s gallery gathers to take down the new untested Captain America and Nomad! WHY WE LOVE IT: You know all those conspiracy theories you hear about? Like how the Jonestown Massacre was a failed MKULTRA experiment by the government, or how Lee Harvey Oswald was trained and brainwashed to be an assassin? Well, what if some of those were true? DEEP STATE is a dream (nightmare?) come true for conspiracy theory nuts like us here at BOOM! WHY YOU’LL LOVE IT: With LUTHER STRODE, DEAD BODY ROAD, and SPREAD Justin Jordan has become one of the eminent voices in hardintelligent, original comics, and Ariela Kristantina (DEATH OF WOLVERINE) brings her unique, idiosyncratic style that has made her a breakout talent. 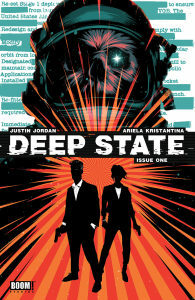 If you’re even remotely interested in conspiracy theory stories from comics like PLANETARY and SLEEPER to films like ENEMY OF THE STATE and THREE DAYS OF THE CONDOR, you’ll be gripped by DEEP STATE!WHAT IT’S ABOUT: John Harrow doesn’t exist, and his job is to make sure that other things don’t exist, too. At any given time, the government is running dozens of black book operations, experiments that aren’t on any official record and are never acknowledged to exist. Some of these are innocuous. Some of them are monstrous beyond reason. And most of the time, they go as expected and the public is never the wiser. Most of the time. John Harrow’s job is to handle them when things go wrong, and do anything to make sure the government’s secrets stay just that-secret. 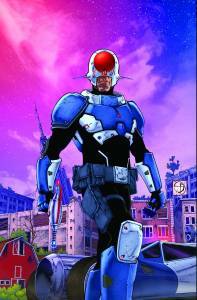 Legendary Comics turns history on its head with the sci-fi adventure Epochalypse, a mind-bending new series from historical author Jonathan Hennessey (The United States Constitution: A Graphic Adaptation) and acclaimed artist Shane Davis (Superman: Earth One). When a mysterious space-time phenomenon causes 600 years of human history to collapse into a single era, societies from the past, present, and future are forced to coexist in a dystopian civilization. To set the timeline straight, an elite team of Resynchronization Officers must rid the world of Anachronisms – futuristic artifacts that threaten the very laws of time. To ensure our future, we must undo it. As one defiant officer leads the manhunt for elusive scientist Dr. Tomorrow and notorious outlaw The Salesman, he is challenged by shadowy agencies, rebel militias, and forbidden desire. Can our hero save history – or doom the future? 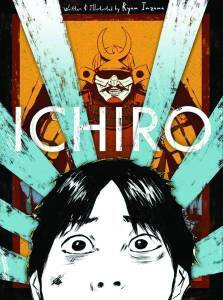 This striking, full-color graphic novel follows Ichiro as he moves from New York to Japan where a shapeshifting tanuki brings him on a fantastic adventure into the mythological world of Japanese gods. Ichiro lives in New York City with his Japanese mother. His father, an American soldier, was killed in Iraq. Now, Ichi’s mom has decided they should move back to Japan to live with Ichi’s grandfather. Grandfather becomes Ichi’s tour guide, taking him to temples as well as the Hiroshima Peace Park, where Ichi starts to question the nature of war. After a supernatural encounter with the gods and creatures of Japanese mythology, Ichi must face his fears if he is to get back home. In doing so, he learns about the nature of man, of gods, and of war. He also learns there are no easy answers – for gods or men. • Dive deep into the Spider-Verse event with the most Spider-filled anthology ever! • ASM team DAN SLOTT & HUMBERTO RAMOS kick it all off! 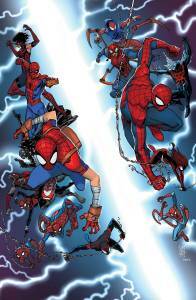 • Skottie Young (ROCKET RACCOON) & Jake Parker (ALL-NEW X-MEN) tell a Mangaverse Spidey story! 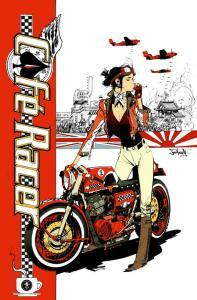 • Robbie Thompson (writer of television’s Supernatural) and Dennis Medri introduce a Steampunk Spider-Woman! • Katie Cook (Marvel animal variants) introduces a new Spider-Character for the ages! We WILL be open on Tuesday, although the place will be in its usual state of pre-Wednesday set-up chaos. For future reference, we pretty much only close for Thanksgiving & Christmas. We tend to close early for New Years & the Fourth of July. That’s it. And here is the Cambridge Public Library page about the event. 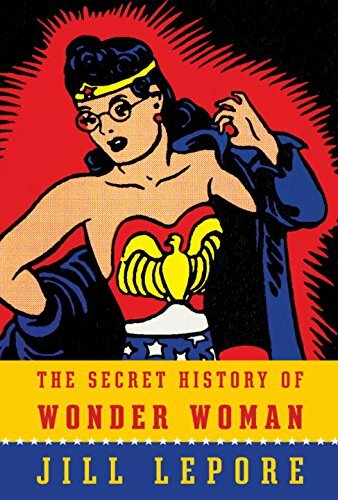 And Jill Lepore, author of THE SECRET HISTORY OF WONDER WOMAN, is giving another talk! Sponsored by Harvard Book Store, the event is Wednesday, December 3, 2014 at 6:00 PM (doors at 5:30) at the Brattle Theatre (40 Brattle St., Cambridge, MA 02138). $5 tickets on sale November 11 at 9am. This event includes a book signing. WE HAVE COPIES!!! Here is the Harvard Book Store event page.